"...this tastes like... a liquid campfire that was stirred with a charred piece of wood..."
I don't remember if that was an Ardbeg or Laphroaig that he tasted, but sure enough, those Islay Scotches tend to be mighty smoky and peaty. And in some ways, his description was dead on. The smoke, the oak, and the hesitance in describing what was likely the brine and peat. 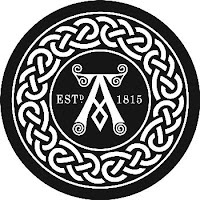 Islay Scotches are a breed all their own (Okay, barring a few random, heavily peated distilleries throughout Scotland). Ardbeg is famous for its heavily-peated, yet somehow delicate and refined scotch, which has included many variations over the year. Their new Alligator release takes the progression one step further by creating a whisky similar to their standard 10 year-old, but aging a portion of the whisky in extra heavily charred (the wood resembles alligator scales) new American oak casks like those typically used for bourbon. The blend is then set in re-fill casks for one year to let the flavors meld. 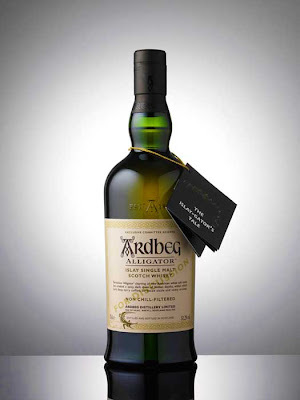 Ardbeg Alligator pours a dark gold color (darker than the 10 year-old). In a Glencairn glass it immediately smells of strong brine and charred, smoky oak, with some medicinal peatiness, vanilla, and a sweetness unique to bourbon, almost like dark molasses. You take a sip and get a plethora of flavors: smoky grilled notes, salty seawater, sweet oak, and a bit of holiday spice in the end. The smoke and salt linger in your mouth urging you to take another sip. For me, Ardbeg Alligator is a much more dynamic, well-rounded, rich expression of Ardbeg, especially compared to their standard 10 year-old. Drink This: if you want a delicious, rich, smoky Islay scotch. Don't Drink This: if you aren't into smoky scotch yet. The novices may have to work themselves up to this point. Scotch, itself, is an acquired taste, the Islays even more so. If you're into the smoky sort of thing, BUY THIS. It's wonderful stuff.